No. 120A, Jalan Impian Senai 2, Taman Impian Senai, 81400 Senai, Johor, Malaysia. Occupational safety , health and environmental issues are one of the most important elements in Malaysia industrial . There are many factors that contributed to this move such as . It could have been the result of the Occupational Safety and Health Act 1994 that imposed higher penalties and jail terms for offenders or the fact that both the employers and employees are increasingly committed in improving the workplace conditions in order to safeguard the employee’s well beings. Due to the consideration of such factors, there has been an overwhelming demand for good quality, reliable and approved safety equipment. The commitment of involvement in providing Occupational Safety and Health services, we had being approached by our customers regularly to sell Personal Protective Equipment. 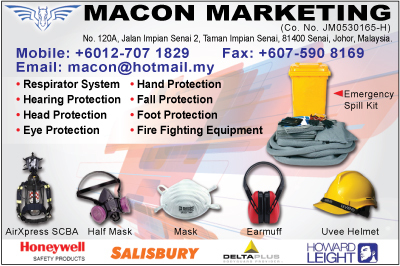 Macon Marketing is one of the fastest growing and dynamic trading company in Malaysia. Established in 2008, this company has successfully created a name especially amongst the multi national industries ,small to medium industries and development at large for its excellent service and reliable safety products. The company business activities involves trading and supplying of a comprehensive range of Occupational Safety and Health equipment ranging from environmental sampling equipment, emergency facilities right to personal protection devices and clothing. In addition to that, the company also provide technical backup services for sophisticated equipment such as self contained breathing apparatus, gas detection devices and emergency response team, conduct training and education program for any personal protective equipment which requires special training and attention by the wearer. From time to time the company also conduct demonstration and participates in any exhibition to promote the company’s wide variety of products. To be the customer first choice in supplying HSE, fire fighting equipment’s and building material providing technical backup services and employees training in this region and all other relevant project & services.. The company is committed in conducting its business activities professionally. Therefore, it is the policy of the company to provide reliable services and to supply quality products that consistently meet their evolving needs. We can achieve this by providing technical backup services for items that regular maintenance and servicing such as environmental sampling equipment, self contained breathing apparatus, respirators, safety harnesses, building material, heavy duty automobile and so on. We believe that by doing so, our customers satisfaction are being guaranteed and thus, we will be recognized for our excellent service. Macon Marketing main office is located in Senai City. With the growth of the customers base throughout Malaysia, as we fore see the substantial growth of industries in that region in the next one or two years. The main office activities are basically administering the human resource, accounts and supervising the operation coordinating the purchase and order of all safety equipment and doing the marketing, sales and promotion of safety equipment for Johor region. Various activities at the main office are being divisionalised to ensure a smooth operation. Each division is required to handle its own scope of work. These are sales, purchasing and procurement, customer service, accounts and administration. The sales and customer service activities are however being decentralized to enable better control and close supervision on the sales activities at each branch offices thus enabling the company to provide efficient and reliable service to our valued customers. Macon Marketing has been in the market for 5 years, we are a very dynamic and progressive company. We dare to face challenges and business opportunities and we believe that striving for excellency, we wish to become the market leader in supplying safety equipment, building material, heavy duty automobile and servicing throughout this region. Our efforts that we have been putting in throughout the years have shown some returns as we are gradually being recognized by our overseas well known safety equipment manufacturers and building material manufacture who finally awarded the exclusive distributorship to us. The most precious asset that a company has is a team of dedicated staffs. We believe that what we have now and what we are today are due to the contribution and effort that they have put in throughout the years. Their commitment, hard-work and dedication have contributed to the rapid growth and progression of the company. As it has always been our policy to provide a reliable and satisfying service to our customers, all of our staffs are being trained continuously in various aspects. Only through such exposures are the staffs are able to perform better in their respective jobs. We have been serving our customers, varying from Private Companies to Public Services throughout Malaysia. Industries such as Petrochemical, Electronics, Petroleum and Oil Refineries, Palm Oil Mills and Refineries, Steel Mills, Foundries, Food, Agriculture, Engineering Work, Furniture, Military, Airlines, construction and developer. Although our existence in this specialized field is merely a few years, we are confidence to say that we have gained the trust and support from numerous companies, from small to multi-national, throughout the country.